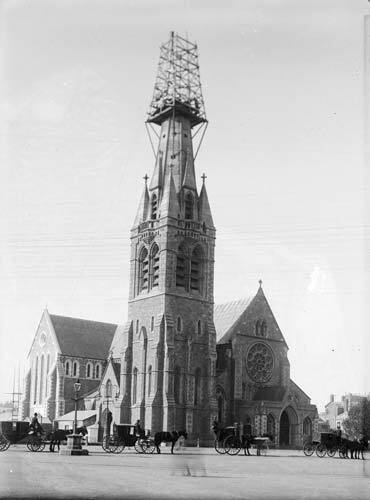 This photograph from 1902–3 shows the spire of the Anglican Cathedral in Christchurch being reconstructed in a copper-covered wooden structure. The spire had first been damaged in the Amuri earthquake of 1888, and it was then damaged again in the Cheviot quake of 1901. On 22 February 2011, both the spire and the tower collapsed in the major 6.3-magnitude earthquake.